Prologue: Located in the southwest of Papua New Guinea (PNG), up against the border with West Papua (Indonesia), Western Province is the largest PNG province with a surface area of 99,300sq.km. (38,340sq.miles), but a population of only 153,000. This is a remote region of mangrove and freshwater swamps, monsoon forests, seasonally flooded grasslands and huge crocodile-infested rivers ie. the Fly, Strickland, Bensbach, Mai Kussa, Oriomo, Bina Turi and Paho Turi. There are few roads and most travel is by boat along the rugged coast or inland up the rivers. 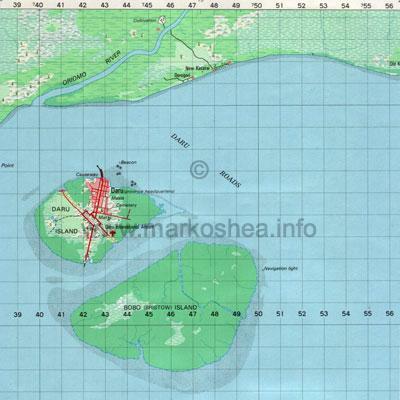 The administrative centre, with a population of 15,000, is tiny Daru Island a few kms off the southeastern coast, the only place no in danger of complete inundation during the wet season. Western Province easily earns the nickname of Papua New Guinea’s “Wild West”. Located in the southwest of Papua New Guinea (PNG), up against the border with West Papua (Indonesia), Western Province is the largest PNG province with a surface area of 99,300sq.km. (i) (38,340sq.miles), but a population of only 153,000 (ii). This is a remote region of mangrove and freshwater swamps, monsoon forests, seasonally flooded grasslands and huge crocodile-infested rivers ie. the Fly, Strickland, Bensbach, Mai Kussa, Oriomo, Bina Turi, Paho Turi. There are few roads and most travel is by boat along the rugged coast or inland up the rivers. The administrative centre, with a population of 15,000, is tiny Daru Island a few kms off the southeastern coast, the only place not in danger of complete inundation during the wet season. Western Province easily earns the nickname of Papua New Guinea’s “Wild West”. 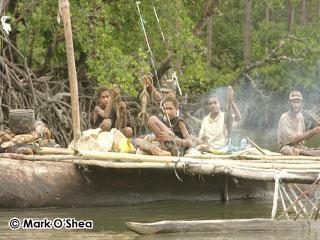 Daru and uninhabited Bristow Islands are located off the coast of Western Province, offshore from the Oriomo River. There are plans to build a deep-water port in the mangroves of the eastern corner of Daru but there are concerns that the destruction of the mangroves in the development area may affect the survival of a rare snake. The Banded mangrove snake (iii), aka the Trans-Fly mangrove snake, (Cantoria annulata) is a small marine snake that is known from only 7-8 specimens collected over the last 100 years, the last 3 decades ago from Sudarso Is. (formerly Prins Frederik Hendrik Is.) in the Indonesian province of West Papua, and from three locations in Western Province, PNG: Daru and Bristow Islands, and the Oriomo River at Abam. (i) 9x the size of Yorkshire, 5x the size of Wales, or almost equal to the US states of Indiana and Delaware combined. (ii) Twice the population of Kidderminster, half the population of Cardiff, or equal to Rockford, Illinois (the 135th largest US city). 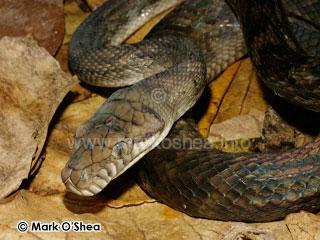 (iii) Not to be confused the black and yellow mangrove snake (Boiga dendrophila), a large treesnake from SE Asia. To this end an EIS (Environmental Impact Statement) was requested by PNG Sustainable Development and my AVRU (iv) colleague David Williams and I were asked to conduct the herpetological study that centred on the rare snake. Hence the first phase of the “SnakeBusters PNG 2008” expedition meant a trip to PNG’s Wild West, to Daru and the coastal region of southern Western Province. The short survey took place between 11-28 April 2008. 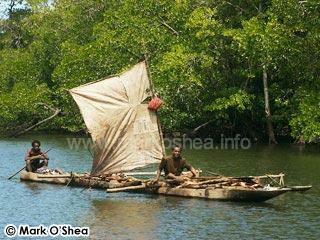 I went out to Daru a few days ahead of David to conduct a recce of the mangroves and check out the boat and boatman availability. 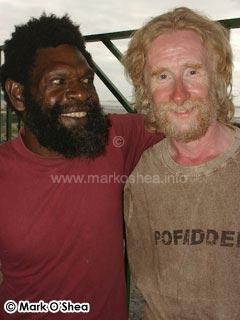 When David arrived we extensively surveyed the herpetofauna of Daru Island and neighbouring (uninhabited) Bristow Island, made two trips up the Oriomo River to Katatai fishing camp, Upiara and Abam villages, and as far as Oriomo station where I was based as part of my first expedition to PNG in 1986, as a member of the Scientific Directing Staff of Operation Raleigh. We also made several trips westwards along the coast visiting the villages of Dorogiri, Mabaduwan and Sigabaduru to search for snakes and other reptiles. 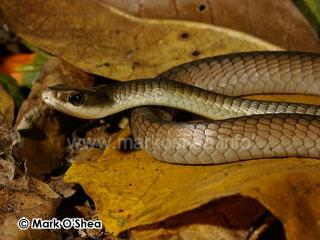 (iv) AVRU (Australian Venom Research Unit, University of Melbourne). I received an Honorary Research Fellowship from Univ. Melbourne’s Dept. of Pharmacology in 2006 to work with AVRU on their ongoing snakebite and venomous snake research in PNG. assisted by PNG Sustainable Development employees (back) Jimmy Peter and (front L-R) Putua Segeam, Tabeg Gibia, Lena Apuri, and Dan Kawi. Overtaking on the Oriomo River. in 1986 who he has not seen in 22 years. rarity, but we did record several other mangrove specialists ie. The Crab-eating mangrove snake (aka White-bellied mangrove snake), Fordonia leucobalia, was the most commonly encountered snake in the mangrove swamps or on the mudflats and during our stay we collated data from 12 live and 6 dead specimens from Iho Creek and Perfume Point. This species exhibits considerable variation in colouration with all grey specimens dominating but speckled black and creams specimens also common (see below). In 1986 I encountered several pale yellow specimens on the mainland and other authors have found red specimens. Distributed widely through the entire Indo-Malaysian Archipelago from northern Australia to Bangladesh, this is one of the few snakes that appears to dismember its prey prior to ingestion, seizing freshly moulted crabs or mud lobsters and shaking them vigorously to break the legs off. The Iho Creek area had a sizeable population of Mud lobsters, Thalassina anomala, their high muddy mounds dominating the area. 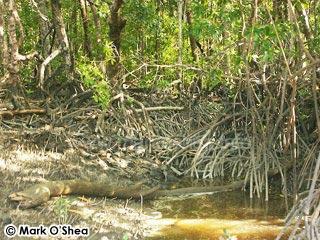 Along with the Red mangrove, Rhizophora mangle, the mud lobster is the architect of the mangrove swamp. 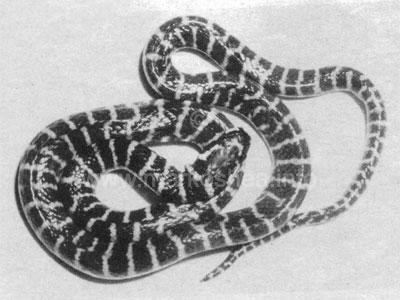 Much rarer than the crab-eating mangrove snake, but still much commoner than any other marine homalopsine snakes in the area, is Richardson's mangrove snake, Myron richardsonii. The alternative common name of grey mangrove snake might suit specimens I've seen in the past but not the single bright orange specimen we obtained from Sigabaduru on the Western Province coast opposite the Australian Torres Strait islands of Saibai and Dauan. Unlike its carcinophagous relative, this species feeds on small gobies and other marine fish. 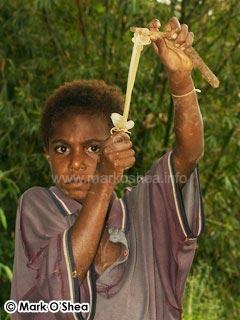 (v) The young Oriomo boy's slingshot is powered by several condoms (unused). Crab-eating mangrove snake, Fordonia leucobalia. this is a speckled female from Perfume Point, Daru Island. Grey and yellow phases also occur. Richardson’s mangrove snake, Myron richardsonii. small lizard in the mangroves. 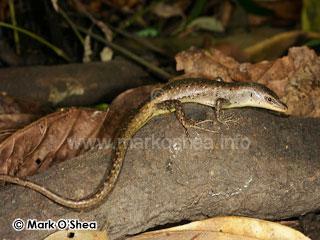 The commonest small lizard in the mangrove swamps was the Shore skink, Emoia atrocostata. This medium-sized skink with its dark colouration and elongate head, is a member of the second largest skink genus in New Guinea. Emoia was subdivided into eight species groups by Walter Brown (1991) in his monograph (vi) and five of those species-groups are represented on mainland New Guinea. However, Emoia atrocostata is the only mainland PNG representative and the most widely distributed of the atrocostata-group being found throughout the southwest Pacific and Indo-Malaysian Archipelago. 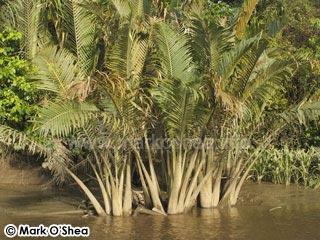 It is a familiar species in most coastal habitats. 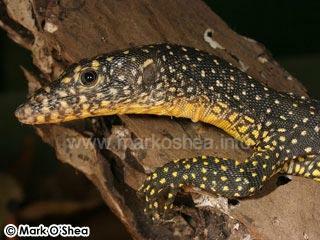 Equally ubiquitous and widespread, but considerably larger, is the Indo-Pacific Mangrove monitor lizard, Varanus indicus. These large lizards are especially common in the southern Trans-Fly of Western Province. During filming on the Bensbach River in 2000 I lost count of the number of mangrove monitors I sighted, often four or five at a time, foraging along the river bank, basking up trees or swimming. On the latest trip we again sighted large numbers of mangrove monitors on trees along the Oriomo River and up mangrove-shrouded creeks on Bristow Island. We also encountered groups of hunters and wood-cutters (vii) who were skinning and cooking monitors onboard their rafts and canoes. Bristow Island was once well known for its large population of Saltwater crocodiles, Crocodylus porosus, but they were believed extirpated. However, the habitat is still prefect with numerous mud-flats and side-creeks that cannot be penetrated by boat, as well as abundant prey. It was no surprise to us that we sighted a medium-sized specimen, a female or a small male, lurking near a mudbank with a safe retreat into a shallow side-creek. And where you find one 'saltie' you can be certain there are others close by. (vi) Brown, Walter C. 1991 Lizards of the genus Emoia (Scincidae) with observations on their evolution and biogeography. Memoirs of the California Academy of Sciences no.15 vi+94. (vii) The illegal cutting of mangrove forest as a fuel source is becoming a serious threat to the survival of this habitat in the southern Trans-Fly region of Western Province. 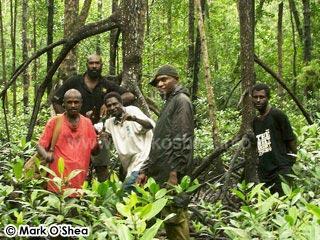 Gangs of men are working deep within the forest, entering via creeks and clear-felling large swathes of mangrove forest. This is happening on Bristow Island which from the outside looks pristine, but enter a short distance up any of the navigable creeks and felled clearings become common-place. 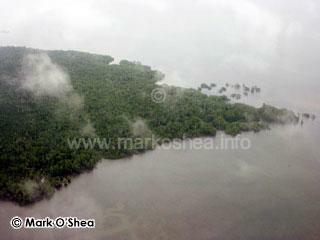 Aerial view of the study area, eastern Daru Island. Iho Creek can just be seen glinting in the bottom left. 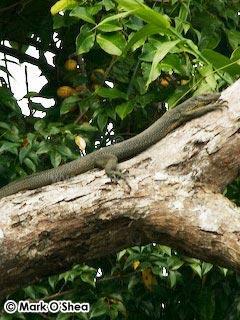 We also recorded a number of species of non-mangrove reptile and amphibians ie. 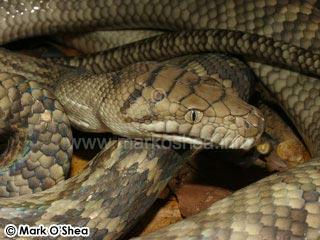 The Amethystine or Scrub python, Morelia amethistina, is one of the most widely distributed and frequently encountered New Guinea pythons. I obtained two specimens during fieldwork on Daru. 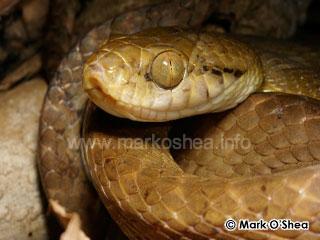 The first was a 2.56m female found coiled on a mangrove stump protruding from the water in the Iho Creek. Iho Creek runs in from the sea and at high tide is navigable by boat all the way up to a muddy track, from where it is possible to walk back to Daru town. The female python looked underfed and may have been post-parturate. She offered little resistance to being captured. I removed the second specimen, a male of 2.75m, from the hollow wall of an outside bathroom in the yard of a Daru house. He was less accomodating of capture and bit me several times as I struggled out from under the structure with him in one hand. Both specimens were documented, photographed and then released in a protected part of the mangroves near a large flying fox rookery. mangrove swamp on Daru Island. removed from an outside bathroom in Daru town. The most frequently encountered snake in PNG is probably the brown treesnake, Boiga irregularis, the Australo-Papuan representative of the rear-fanged mildly venomous Asian catsnake genus Boiga, and this trip was not different, we obtained a specimen near Iho Creek. The nonvenomous treesnakes of genus Dendrelaphis are a common sight in New Guinea but on this excursion we only caught a single specimen of Common treesnake, Dendrelaphis punctulatus, at Abam on the Oriomo River. 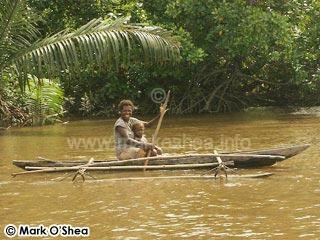 caught at Abam on the Oriomo River. 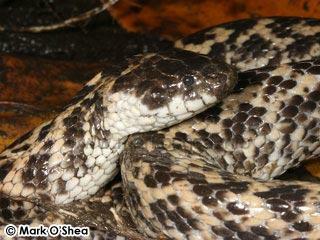 is a common snake in all habitats. This is a Central Province specimen. Although both I and David have captured numerous highly venomous elapids on previous visits to Western Province, we only had two sighting this time, both in the mainland coastal village of Dorogiri, directly opposite Daru Island. 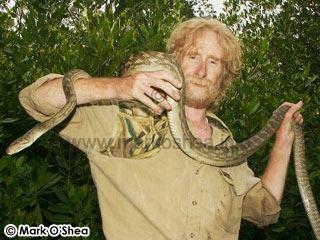 The first specimen, a half-grown Papuan taipan, Oxyuranus scutellatus canni, managed to evade capture but David managed to bag the second specien, a Black whipsnake, Demansia vestigiata. Unlike our other snake captures, which were documented, photographed and released, this specimen was retained and returned to Port Moresby where the AVRU Serpentarium is located. 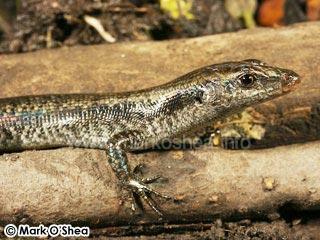 We found five other skink species during out visit to Western Province. 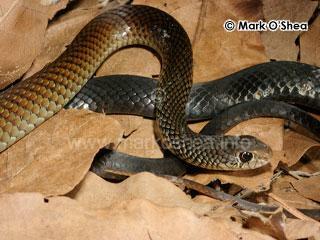 This is a low number as the southern Trans-Fly is home to at least 28 species of skinks. 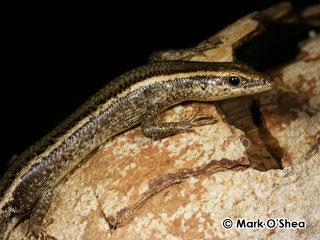 The smallest was the Trans-Torres litter skink, Carlia macfarlani formerly Lygisaurus macfarlani. 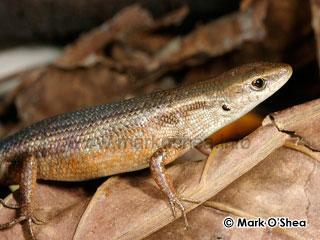 Another common skink of the southern Fly is the Aramia four-fingered skink, Carlia aramia. The elongate headed, long-tailed skink, Emoia longicauda, is a relative of the shore skink but found in more terrestrial habitats and a good climber. The more fossorial, etiolate-bodied but short-limbed Black-tailed forest skink, Glaphyromorphus nigricaudis is also fairly common. 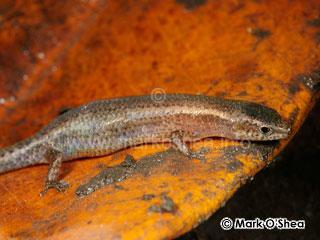 The fifth species encountered was the Trans-Fly snake-eyed skink, Cryptoblepharus xenikos. 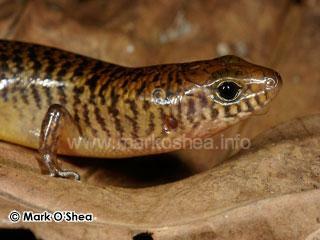 These small, slender, highly arboreal skinks possess transparent brilles over their eyes like snakes. 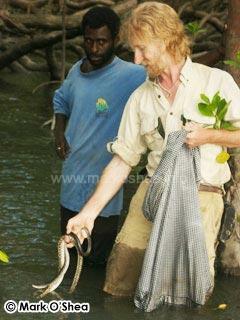 The best location we found for skinks was the Katatai fishing camp on the lower Oriomo River. This occasionally occupied camp comprised several timber and palm built buildings, and abandoned gardens with all the clutter accompanying them, ideal habitats for reptiles. a tiny four-fingered skink caught on Mabaduwane Hill. Aramia four-fingered skink, Carlia aramia. at Katakai fishing camp, Oriomo River. has brilles instead of eyelids, like a snake. 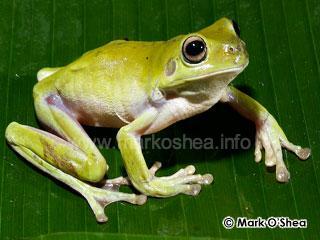 White's treefrog, Litoria caerulea, in Daru town. The only frog identified during the trip to Western Province was White's tree frog, Litoria caerulea, a stout green treefrog also known from northern Australia. A number of other small treefrogs were sighted after rain but none were collected or identified. However, our primary reason for being in Western Province was to search for the rare Banded mangrove snake Cantoria annulata. Our research suggested that the habitat around Daru has changed considerably since it was recorded there. Gone are most of the coral reefs and seagrass plains. Talking to villagers, especially at Abam and on Daru, and also on the phone to the retired kiap (viii) and herpetologist Fred Parker, who now lives in Queensland but who had conducted extensive surveys of the region during his time there in the 1970s, we came to the conclusion that Cantoria annulata showed a preference for these lost habitats, as well as riverine Nipa palm stands. 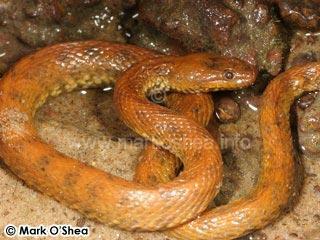 It therefore seems unlikely that this little snake still occurs on Daru, but there are plenty of other stretches of suitable habitats in the southern Trans-Fly of Western Province where it may survive and we obtained several recent eye-witness accounts from Oriomo River villagers which certainly matched the description of our diminutive quarry. Hopefully on a future trip to Western Province we will be able to find specimens on the Oriomo River, or further west along the coast. (viii) A kiap was a pre-independence government patrol officer. Back in Port Moresby, David and Mark prepare for a trip to an old stomping ground, the active volcanic island of Karkar off the coast of Madang Province.